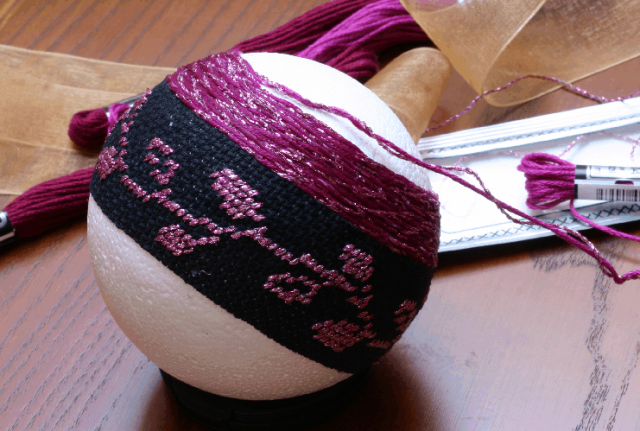 Pinwheel Ponders: Some thoughts on Cross stitch Ball ornaments. 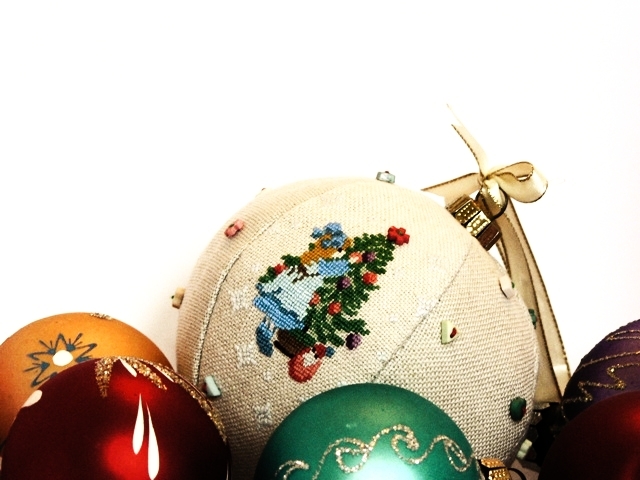 Cross Stitch Ornaments. 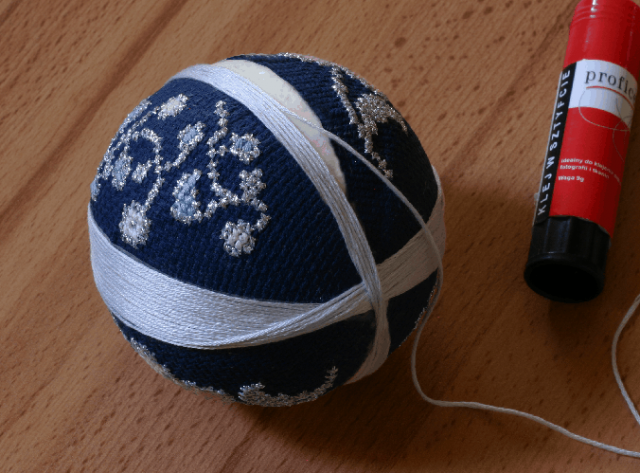 Cross stitching Christmas ornaments gives me lots of time to ponder various ways to stitch, finish, and gift wrap them. 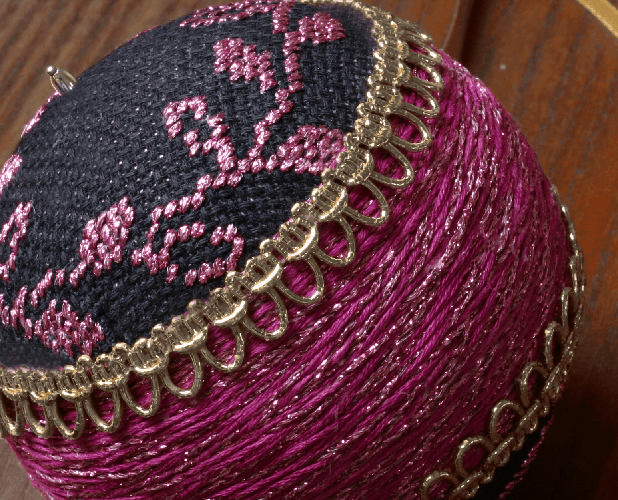 Some thoughts on Cross stitch Ball ornaments. 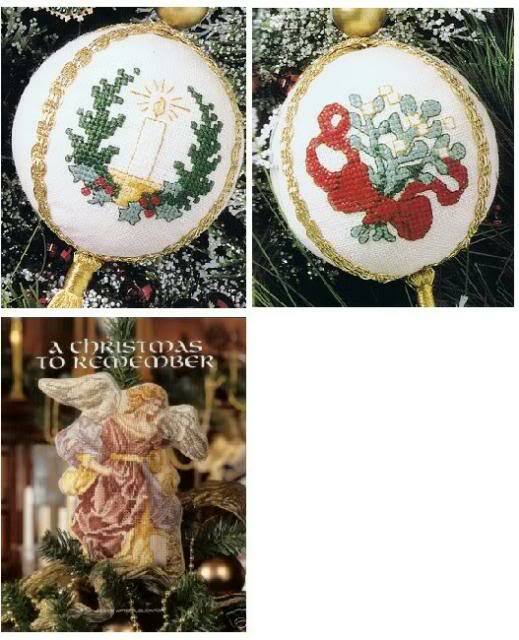 When I asked on 123 Stitch MB about Cross stitch Ball ornaments Phyllis W. shared a template that she had for a four piece one. For this ball the four pieces are on the bias and joined at one end. Phyllis also shared a N*O*E*L one that she had stitched almost 30 years ago. 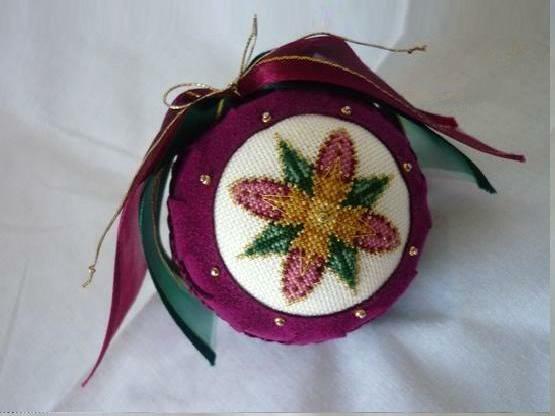 The pattern, "Kissing Ball", was by Jeannie A. Martin. (Copyright Linda Dennis of The Finish Line.) It has 8 sections on a 6" ball. Phyllis says that there was also a very pretty design with mistletoe boughs on every other petal. 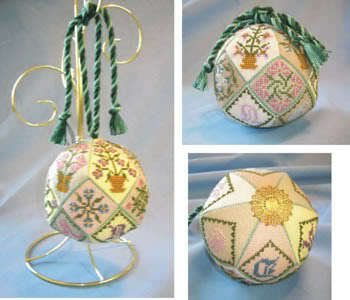 Since then I have also found photos of some lovely Cross stitch Ball ornaments by In a Gentle Fashion. The first is a Nativity series and the second is a Christmas Ball series. It says on the website that the latter are made of 6 panels. 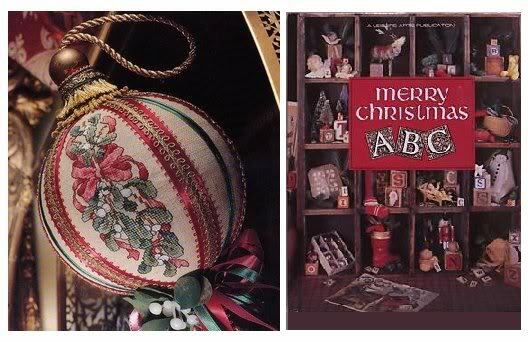 In 2008 I made a cross stitch ball using a "Christmas Greetings" by Ellen Maurer-Stroh. I stitched the design twice on one rectangular piece of 22 count hardanger. 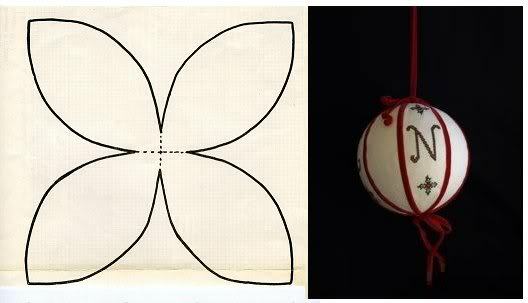 Then I cut the "petals" for the ball, leaving them attached at the "equator", like the yellow lines in the bottom picture diagram below. Each petal is 1/2 the circumference of the ball tall and 1/4 of the circumference of the ball wide. Along the way I learned that stiff fabrics, like most aida, don't mold as well to the curves of the Styrofoam balls. The 22 count Zweigart fabric that I used didn't naturally follow the curves of the ball but it conformed better after I dampened the edges. If one did want to use a stiffer fabric than I would recommend that they use a design that could be stitched on the bias or choose a design that would allow them to use 6 or 8 sections. I also discovered that if you want to wrap wide trim around the balls than the ribbon needs to have a lot of give. Some upholstery trim will work and bias strips of fabric may work too. I ended up using fold over satin elastic (5/8 inches wide) and upholstery trim. I have made some adjustable templates for the petal shapes (lens shapes) that one uses to cover Styrofoam balls. Click on the link below to find the page about them. November 2012 Postscript I found a webpage that has a lens pattern generator. Click on the photo to visit the webpage. 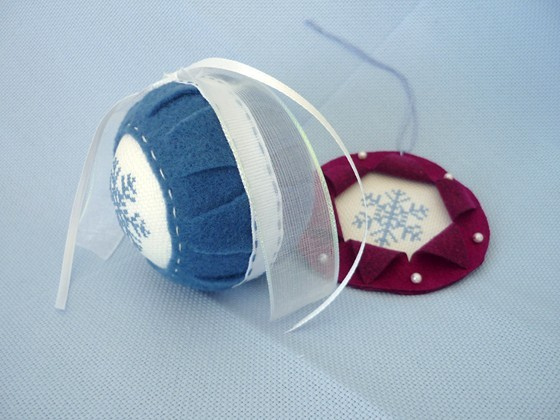 I also found a website that sells kits for making this type of ornament on an 8 cm ball. They wind thread around the balls to fill the gap between the fabric pieces. Click on the photo below to visit the website. 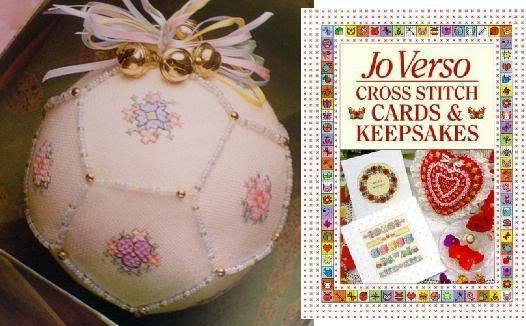 Ball made from 12 pentagons from "Jo Verso Cross Stitch Cards and Keepsakes". 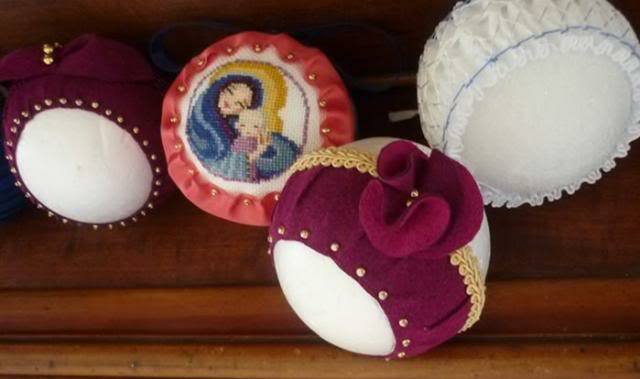 Finally, there are the balls that have the cross stitch designs framed by fabric or ribbon. 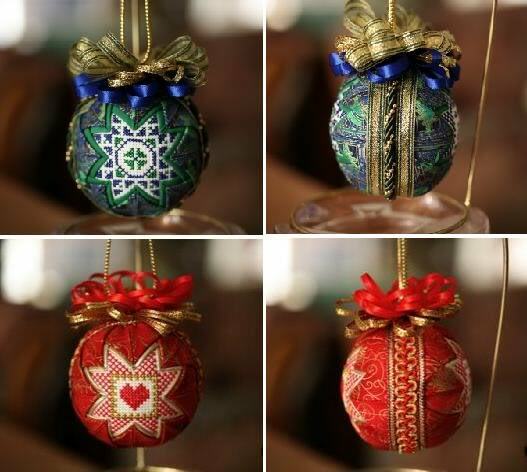 There are the ones from the ASN book "Easy Cross Stitch Folded Star Ornaments". I made some of these in 1992 but I would rather share pictures of two very nice ones I saw for sale on ebay. 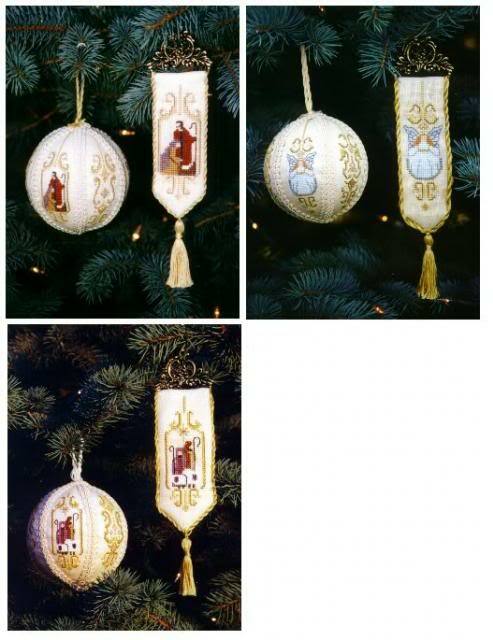 I have recently noticed that there is a second book of these ornaments. It is currently only available as an e-book download. The first link below will show you a close up of the covers and the first page. The second is the web page where one can order the book. 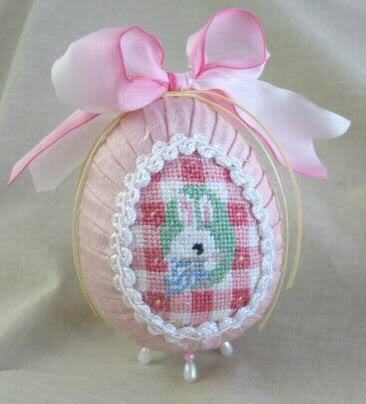 In 2011 I was inspired by this egg shaped ornament that uses pleated fabric to frame a needlework design by Associated Talents. 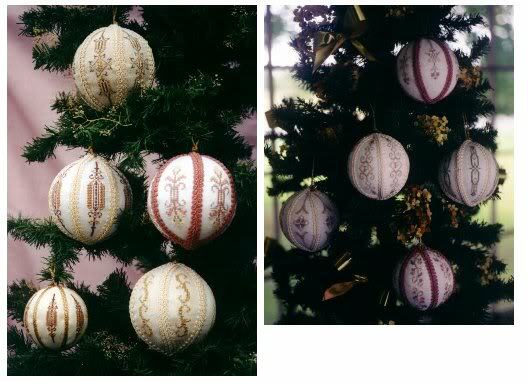 I made mock ups of some ball ornaments where the cross stitch is (or could be) framed by smocked, pleated or slashed fabric or ribbon. To see the blog pages about these projects click on the photos below. 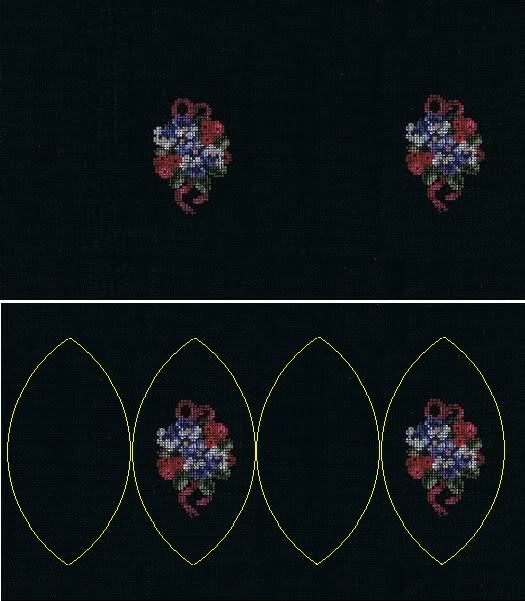 In 2012 I have found a website that sells kits that use wound thread to cover the gap between two cross stitch circles. Click on the photo below to visit the website. I have started to do some experiments using a stitched band and gathered fabric. Here are the first four. Pinwheel 2008, 2010, 2011, 2014 and 2016. Wow, I cannot wait to try some of your techniques. Thank you sooooooo much for having this blog. I love it!!! LOVE IT!!!!!!!!!! I am SO going to try this! Thanks for sharing! You are both very welcome. It is nice to pass on some of what others have shared through their books and blogs and message board posts. Hello ! wow very beautiful and delicate ornaments , greeting cards . Hello! And THANK YOU for your kind words and link to our Folded Star Cross Stitch book. I was the author of the first book, published by American School of Needlework & just recently put together the NEW Ebook. The photos are LOVELY and yes, they're my designs from the first book. Again, THANK YOU so much for your kind comeents and the link! Hello Carm. It is so nice to meet you, so many years after I first bought your book and read your words. I wish you every success with your new e-book. Those are nice! Perfect for the Holidays! Excellent post - great info and just the sort of thing I was looking for! 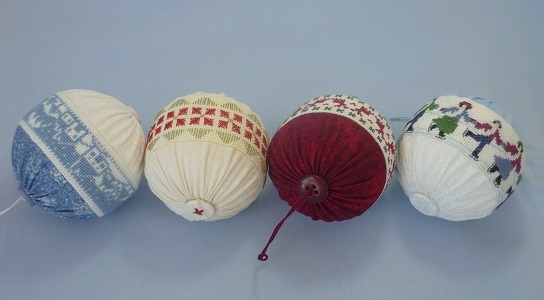 As an addition to your list of stitched balls, have you come across Quaker pinballs? I think they were traditionally knitted, but stitching looks possible too! Thank you for making me aware of Quaker pinballs. A quick google confirms that they were mostly knitted but I did find a photo of this 1808 cross stitched one. http://tinyurl.com/bztbo7n I can understand why knitting was more common as it would make it easier to ease the flat shape into a ball. These are beautiful. Makes me want to get out the thread box again. I've made many tree ornaments but not cross stitch....yet. I'm just beginning to post some of mine on www.dillydallyingaround.com this fall. Thank you so much for sharing all this information. I've been looking for something like the "ball pattern generator" for years. Wish I could find one for smooth foam eggs. I sure its a much more complex problem. Sigh..... But, thanks again. I wish I could help with the egg pattern Lisa. Given that every manufacturer probably makes a slightly different shaped egg I think that one would probably have to make a mock up in something like interfacing and then try it on for a fitting. (Something like fitting a wedding dress!) Or maybe the manufacturers could help you find a pattern. Since 1988 I have been making Christmas ornaments as gifts for our siblings, parents, grandparents, some nieces, nephews and friends. 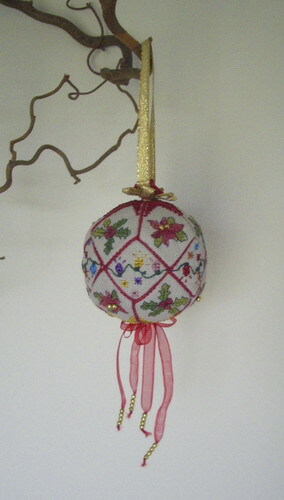 The number I have made each year has varied from 18 to 30 but I figure that I have easily made more than 400 ornaments. 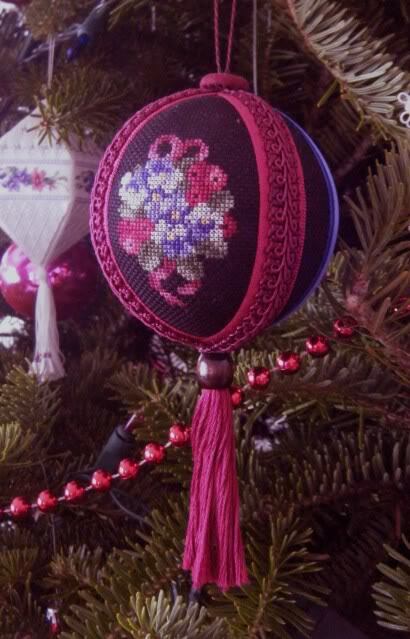 About half of them were cross stitch ornaments. While I am making the ornaments I have a lot of time to "ponder" the fastest and tidiest ways to put the finishing touches on my ornaments. 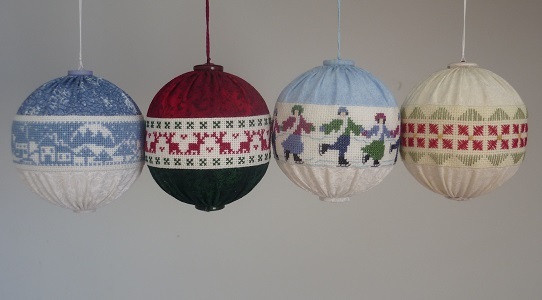 I am also thinking about how I am going to find/ make 20 or so similar sized boxes to put the ornaments in. On these pages I plan to share some of my "ponderings".